Back to school shopping is in full swing here in NYC as school starts in 3 weeks. Everyone buys clothes, shoes and school supplies, but for some reason people tend to forget to get memory cards and USBs. In our modern society, which is computer based, these little items are necessary when having to save important work or transfer important papers from one computer/device to the next. The worse feeling in the world is completing a 10-page paper and not being able to save it or print it for whatever reason. That’s where these little modern marvels come into play. Today only, enjoy special savings on select microSD cards, SD cards, and USB flash drives from SanDisk. This one-day offer is valid on August 14, 2013, or while supplies last. Discount is already included in the current Amazon.com price. Applies only to purchases made from Amazon.com and does not apply to products purchased from third-party merchants on the Amazon.com website. Two new coupons were released earlier today and here is a great deal to go with them. Easter is next weekend and if you are looking for some great items to put into those Easter baskets here are two great deals. Target will be having a sale on Cabbage Patch Cutie Dolls and Barbie dolls, so print these coupons before they disappear or reach their print limit. Here are the two deals you can expect at Target starting this Sunday, March 24. 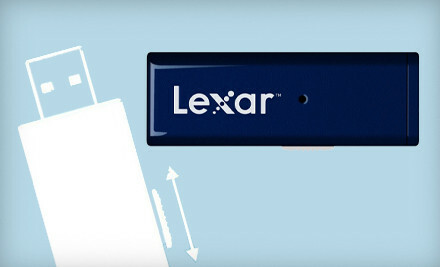 One, Two, or Three Lexar JumpDrive Retrax USB Flash Drives (Up to 71% Off). Shipping Included. Data stores safely within the confines of Lexar’s 8 GB jump drive, which features a retractable design to protect the drive while on the go. The USB 2.0 male output pops out to plug into Mac and PC systems for easy sharing and saving of information. An LED activity light blinks to indicate when data is writing to the drive. While not in use, the drive has a built-in loophole that allows it to dangle securely from key chains, backpacks, or pigeon ankles. Shipping is included for each option.